The winning team in the 2003 SHSU Faculty/Staff Golf Tournament was, from left, Frank Krystyniak, Terry Thibodeaux, Ron Randleman and Richard Cording. Finishing second was the team of Dean Lewis, Ed Blackburne, Mitch Muehsam and James Bexley. 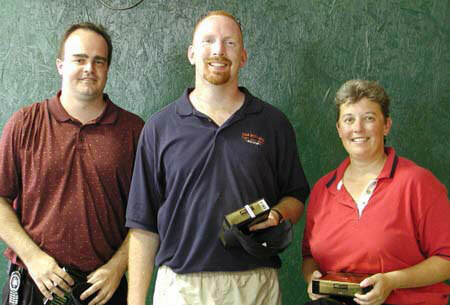 Individual winners (below) included, from left, Matt Berkheiser (long drive - men), Mike Ramsey (closest to pin), and Carolyn Tucker (long drive - women). The tournament was held May 19 at the Raven Nest Golf Course in Huntsville.